This came across a certain social networking site (thanks Collette!) I waste time on. 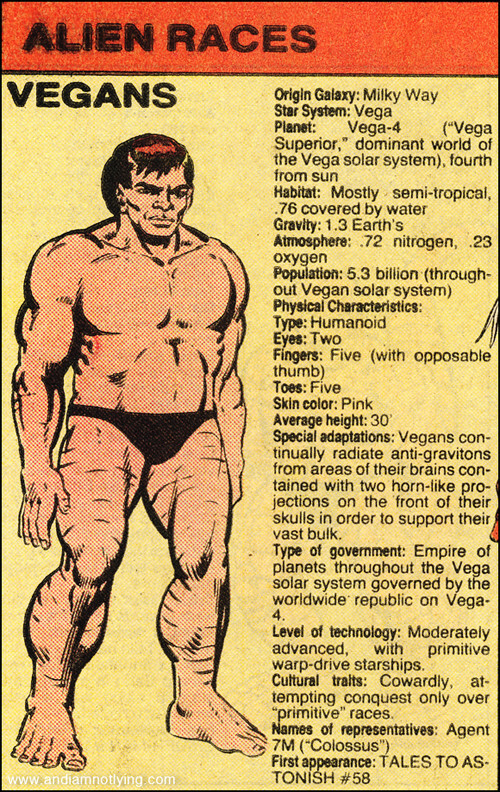 According to here it’s from the 1983 Marvel Comic Universe Handbook. I think I’m far from cowardly, but I will take those anti-gravitons! Secondly, anyone who knows me is aware of my internet addiction. As soon as I have some down time I’m on my space phone flipping through Google Reader. I’m up on all sorts of stuff that I have no reason to be. My idea is to share some of the most interesting links I come across on the bottom of my posts, ala bikinginla.com. We’ll see how it goes! Thanks for reading and please let me know if you like this new feature. A new, favorite site, Sweat Science says Turn down the thermostat to battle obesity epidemic. Duh. I grew up on the East Coast with a mom who kept ours at a chill 59 degrees F, which is to the dismay of anyone I have to share bills with. Via LA.Streetsblog is The long and triumphant history of women in cycling, a history I learned, interestingly enough, from my West Coast Cycling Lonely Planet book. When I was in Vancouver preparing for my own west coast trip I scribbled one of those quotes on the wall of the punk/collective house I was staying at. DC.Streetsblog meanwhile caught up with a Southern California Republican member of the Transportation and Infrastructure Committee who thinks roads pay for themselves and bikes are only for recreation. Is it true ignorance or just his political position? Speaking of politics, things are wild with UK students and folks in Egypt. Are you watching US students and citizens? Change is possible. Lastly, I’ll leave you with a post from a vegan athlete who is concerned she’s not getting enough protein. I know it’s possible to, but I’m empathetic to her concern that she is not. It is reinforced in our society over and over that protein from animals is superior. It’s tough to always go against the grain. Stop by her site and let her know how you get enough protein. Thank you for stopping by, and for the support. I read and read in vegan lit that you can get enough protein; I even do the math (like I did today!) to prove it to myself. But there is such a prejudice against vegetable protein sources, and in favour of eggs and lean meats. The paleo diet has really taken off recently too, and that doesn’t help.. Anyway, the idea that I could get support from the (online) vegan community means a lot to me. It hadn’t really occurred to me that I could counterbalance the crazy bodybuilding culture with that, and it gives me a lot of hope that I could reconcile my training commitments with my ethical ones. It’s a horrible feeling harbouring what you feel are conflicting goals. Matt – I like the idea of sharing links . . . but I loathe the way that BikingInLA does it. A Streetsblog style bullet list or something like what LA Observed does is far more preferable. Just my 22 cents. Just found your site and wanted to drop you a note to tell you how much Im enjoying browsing through it. Im a vegan runner and its always lovely to stumble upon & check out other vegan athletes. Best to you & keep up the good work eh? @Cherie Welcome! Glad you found my site and I hope it’s useful for you. @Alex I’m going to play around with different formats. I prefer the writing in the above one, but I don’t like it visually. LA.Streetsblog style probably makes the most sense.